Neighborhood parks can be a place where people play, exercise, socialize, or commune with nature. Research even suggests that park use may improve life quality and health. But how much do they really get used, especially in low-income urban neighborhoods? What leads people to use or not to use them? In a paper published recently in the Journal of Urban Health, SRC’s Natalie Colabianchi, with lead author Christine Vaughan of RAND and co-authors Gerald Hunter, Robin Beckman and Tamara Dubowitz, also of RAND, used data from the Pittsburgh Hill/Homewood Research on Exercise, Neighborhoods, and Health study to examine these questions. This research is important because research has shown that parks in lower-income areas are less used than those in higher-income areas. Likewise individuals with lower incomes are less physically active and suffer more chronic conditions. 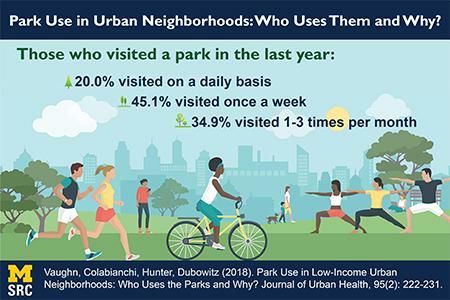 So, neighborhood parks offer a free or low-cost alternative to private gyms and may help those with lower-incomes prevent illness. Participants in the study were 1,003 residents of two low-income mainly African American neighborhoods in Pittsburgh. Over 80 percent of participants said they had visited a neighborhood park at some point in the past, and about 46 percent had done so in the past month. Nearly three quarters of participants perceived that the park they identified as closest to home was safe or very safe. However, over 90 percent of residents were not aware of which park was actually closest to their home. In general, participants lived more than 3 miles from the park they identified as being closest to their home but less than a half mile from the park actually closest to their home. Vaughn, Colabianchi, Hunter, Beckman, & Dubowitz (2018). Park Use in Low-Income Urban Neighborhoods: Who Uses the Parks and Why? Journal of Urban Health, 95(2):222-231.